Diamond Studs was the first show I wrote music for. My writing partner, Bland Simpson, and I were playing in a band called Southern States Fidelity Choir, working mostly at the Cat's Cradle in Chapel Hill, NC. 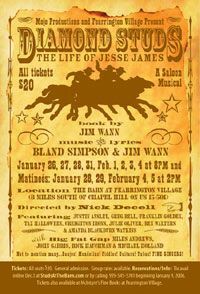 In 1974 we decided to write a musical about the life of Jesse James, and perform it with our friends, the original Red Clay Ramblers, led by the late, great Tommy Thompson. Directed by John Haber with musical staging by Patricia Birch, Diamond Studs ultimately ran off-Broadway to sold-out houses from New Year's Eve, 1974, till mid-July, 1975, and then toured. The link below has all kinds of information, pictures, reviews, about that production-a real feast for Studs fans. A wonderful 30th Anniversary revival of the show was produced in January-February near Chapel Hill by Franklin Golden's Mojo Productions. For me, Diamond Studs was a great journey of high spirits and discovery. All kinds of people showed up, and some hung around to say hello. Walter Cronkite and his wife Betsy taught me how to say "Missoura" correctly. Sir Alec Guinness, impeccably turned out in a 3-piece pinstripe suit among us ruffians, declared, "I have to go back to England tomorrow, but thank God I got to see this show!" Carol Channing was there-I could see her blond coif and silver flask from the stage. Barishnykov came and told Bill Smith, who danced on tables and once snatched a patron's toupee from his unsuspecting pate, how much he liked his moves. My parents and grandparents were there for opening night and stayed on at the Algonquin for a week or so, treated like royalty. Not so much because the show was a hit-that was a plus, of course-but because the owner of the Algonquin in 1975, Ben Bodne, had been a paper boy in Chattanooga, where I grew up, and had bought his first suit from my grandfather, who owned an old-fashioned men's clothing store downtown. Well! After that it was fresh flowers and champagne in the rooms every day for my folks. You can't make this stuff up. I'll never forget the moment my father met Irving Caesar, a grand old songwriter passing through the lobby, the man who wrote the lyrics to "Tea For Two." My dad said, with stars in his eyes to make the connection, "I've danced many a no-break to that song!" A no-break was a dance on your dance card, back in the day, when you were dancing with somebody special and no one could break in. The whole giddy experience of Diamond Studs in New York was like that.